All that for three people! There was also toast, fried tomatoes and, of course, a pot of tea each. The eggs were delicious and the bacon had just the perfect amount of crispiness. I’m getting hungry now just remembering it! Mmmmm. As I mentioned in my last post, Friday was the 8-year anniversary of me moving to Karlsruhe! When Jan suggested going out for a drink that night, I don’t think he was intending it as a celebration of that fact, but I’ll take any excuse 😉 Most of our friends were busy or out of town, so it ended up being Jan, K and I. We decided to go to KofferRaum – a popular cocktail bar in town – and by some miracle we actually got in! I think this was our fourth try… every other time it was completely full, and we were either told “not tonight” or “maybe try again in an hour?”. This time we got lucky… with only three of us, we were able to squish into a little corner by the bar. We were positioned next to a little “window” (well, gap in the wall), where you could see through to behind the wall, so of course my first act was to take a photo of the alcohol next to us. I don’t actually remember the names of any of the cocktails we had, but here’s a photo of Jan’s and my first ones. Mine is on the right… I remember it contained run and passionfruit juice, but that’s it. It tasted very nice though. And very tasty it was, too! The cocktails at KofferRaum are more expensive than at other places in Karlsruhe (between €8 and €11 euros each), but they are all made using the very best alcohol and things like fresh herbs (my second cocktail contained a large sprig of fresh sage), so you get what you pay for. The waiters also come around with free cucumber-infused tap water for all guests… usually unheard of in Germany! If you’d like to go to KofferRaum on a weekend, I highly recommend turning up early otherwise you will not find a place to sit! (And it’s not the kind of place where you can just stand anywhere). You’ll find Hirschstraße 17 (south of Europaplatz) and they’re open from 7 p.m. Monday-Saturday. Be warned, the cocktails are all quite strong, but at that price you’ll probably be wanting to pace yourself anyway! On the first day of my brother’s visit, we decided to go out for brunch. 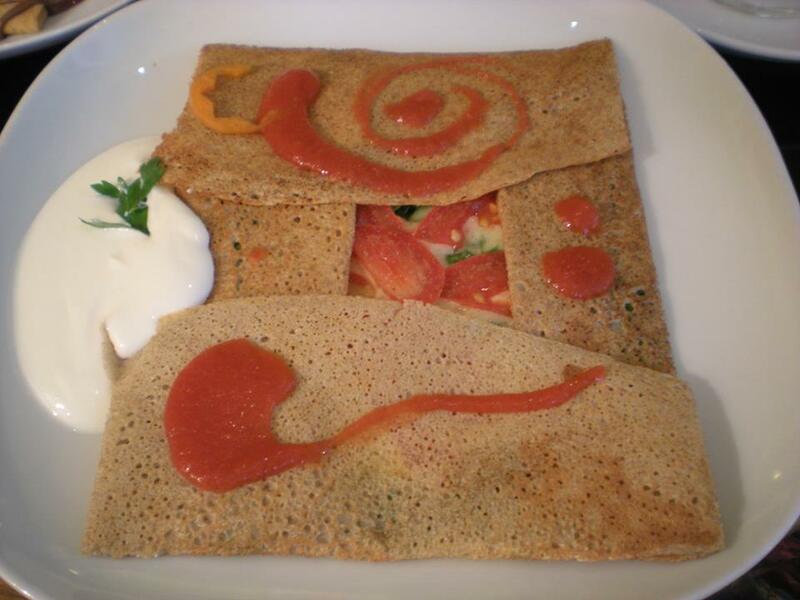 I had been to Café Pan, an organic café and creperie, once before and really enjoyed it, but had then promptly forgotten its existence until it was reviewed on Karlsresource. They are closed on Sundays, which limits the opportunities for me to visit, but being off work during the week meant I could actually go there. On my first visit, we sat outside in the courtyard, but as it was raining off and on the day my brother and I went, we decided to see what it looked like inside. 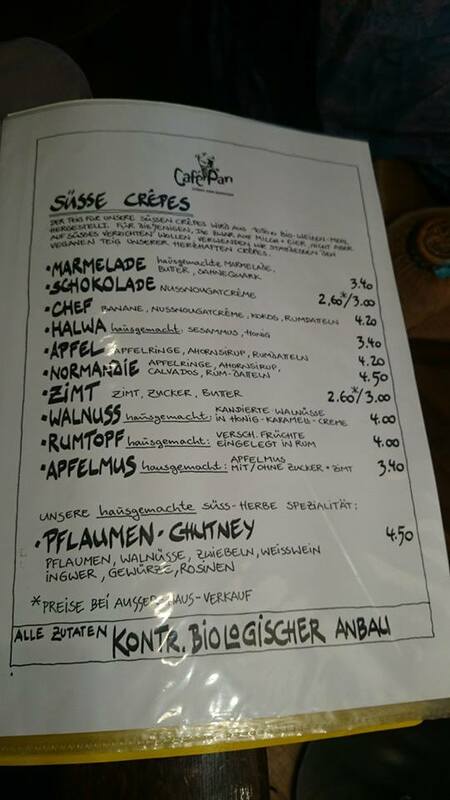 My brother went for the Schokolade crepe, which was topped with Nutella. Meanwhile, I decided to start my day with something savoury and had a spinach crepe, consisting of spinach (obviously), tomato and cheese… I asked for it without the egg. To drink, we both opted for coffee, although various freshly squeezed juices were available. Maybe I’ll try one of those next time. My brother and I both thoroughly enjoyed our crepes and I will definitely be going to this café again… hopefully it won’t take me several years this time! The market on Gutenbergplatz is Karlsruhe’s oldest weekly market… and, according to all the people who told me to go there, also the nicest. It’s probably the largest, too, along with the one on Stephansplatz, which it alternates days with. I’ve been meaning to go ever since I first heard about it two years ago, but until now I’d never made it. Everybody I spoke to recommended getting there early and, let’s face it, I’m far too lazy to get up early on a Saturday, especially since Gutenbergplatz isn’t exactly around the corner from where I live! But the Take 12 Trips challenge gave me just the kick up the backside I needed to actually drag myself out of bed and head on over there. According to the Karlsruhe city website (view it here, in German only), the Wochenmarkt Gutenbergplatz ( Weekly Market on Gutenberg Square) takes place on Tuesdays, Thursdays and Saturdays from 7:30 a.m. Both Tuesday and Thursday are out for me – I’m already on my way to work by that time – and there was absolutely no was I was going to be anywhere near Gutenbergplatz that early on a Saturday, but I did manage to get myself there for 5 to 10, which is still pretty early – especially considering I walked there, which took me half an hour! Yep… I definitely think this can be counted as a trip. I even took a couple of photos for you on the way there, almost like a real tourist ;-). As well as the usual fruit & vegetable and flower stalls, this market has stands with spices, fresh herbs, tea, cheese and various international specialities – I saw a stand selling Asian goods, a van with Italian goods (lots of parmesan!) and a stall selling “südländische Spezialitäten” – literally Mediterranean specialities, but what I saw there mainly looked Turkish and Greek. And, being Germany, there of course had to be bread! I spotted two vans selling various different kinds, both with huge queues in front of them. Here are a few photos. I apologise for the terrible quality of some… in such situations, I’m always paranoid that the stall owner might tell me off for taking photos of their wares instead of buying them! The trees also look much nicer when they’re in bloom or completely covered in leaves. There are two fountains on the North side of square – the Krautkopfbrunnen and the Pelikanbrunnen – but neither has been switched on yet. It went cold again last week though, so they’re probably waiting to be sure that the spring is going to stay! When: Tuesdays, Thursdays and Saturdays starting at 7 a.m. The market is quite nice and certainly offers more choice than my own local market (which I think has about 6 stalls!). I wouldn’t say it’s something all visitors to Karlsruhe must see, but if you’re into markets and stuck for something to do on a Saturday give it a go! It’s a produce market though, so don’t expect to find clothes, books or anything of that sort! Saturday is probably the best day to go to that particular market as may of the stalls aren’t there on Tuesdays/Thursdays. Alternatively, if you’re around on a Friday, check out the market on Stephansplatz instead. It has many of the same stalls that go to Gutenbergplatz on a Saturday and is much more central (I believe Stephansplatz is considered to be “Innenstadtwest”, with the actual “centre” of town being the castle). Do you like to get up early and go to the market? Or do you prefer sleeping in on a Saturday, like I normally do? Let me know in the comments. 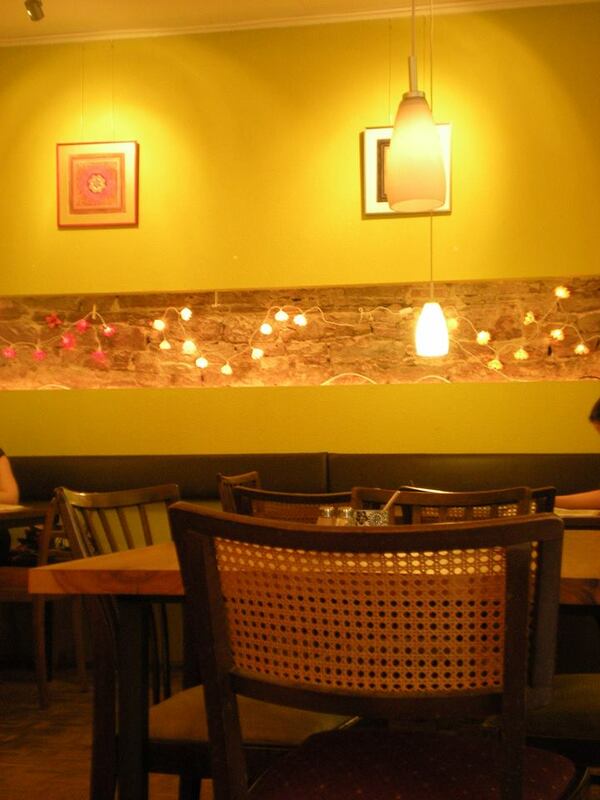 The basic concept behind Bratar seems to be organic and local. The menu assured us that the pigs from the Bratwurst are kept in a manner appropriate to the species, with plenty of space and the right kind of food. They live in Schwäbisch Hall, which makes them local in the sense that it’s the same Bundesland (and there probably aren’t too many pig farms in the Karlsruhe area, to be fair). All three of us chose to drink Alpirsbacher beer and eat a burger. The burgers come in three different sizes – single, double and triple. I chose the double burger, which was 300 g of beef! They also had turkey burgers, vege-burgers and a children’s beef burger, which I assume was smaller. All the burgers come with lettuce, tomato, onions and gherkin (I ordered mine without the gherkin) and you can then add extra ingredients yourself. The list of extra ingredients is fairly long and I’ve already decided I will have to go back to try out more combinations! This time I went for jalepenos, goat’s cheese and bacon. The bacon was grilled and very tasty, but I think another cheese would have been better in this combination… the mid taste of the goat’s cheese was pretty much drowned out by the generous portion of jalapenos. That was my fault though, nothing to do with the restaurant! You can also choose from three different types of bread bun, although I just went with the traditional burger bun that it comes with automatically. To go with my burger, I chose the rosemary potatoes, which were amazing! I love potatoes, and these ones were nice and crispy with just the right amount of rosemary. They came with a sour cream dip, which also contained rosemary and provided a nice contrast to the spiciness of the jalapenos. My burger… please excuse the terrible photography! The kitchen, which is in the middle of the restaurant, has glass walls so you can see inside. I saw some chips (fries) through the window as we were leaving and thought they looked tasty too… nice thick cut chips, not the barely there “fries” you get at McDonalds and co.! This is definitely the best burger I’ve had in Karlsruhe and I intend to go back some time.